Twenty Decorative Carving Projects in Period Styles Decorative and architectural carvings have adorned buildings throughout history. Whether in the form of gilded opulence from the Georgian period or decorative figures found in ordinary houses from the Victorian age historical inspiration can be found by modern woodcarvers at all levels of experience. Twenty Decorative Carving Projects in Period Styles includes carving projects ranging from the quick and simple to the more challenging and detailed. Author Steve Bisco has set each project in historical context and has provided a tracing pattern with essential dimensions step-by-step instructions and photographs of the finished piece. 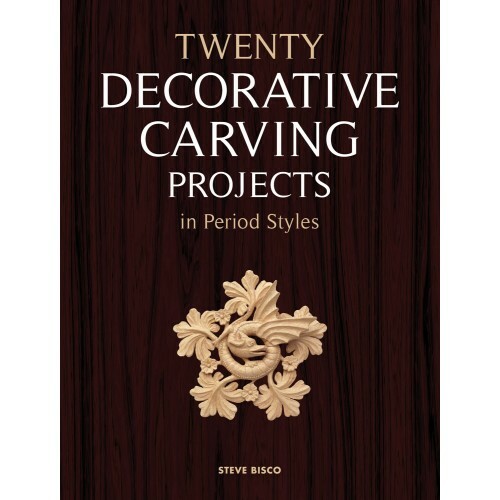 If you are interested in creating a historic feel in your own home developing new carving skills and gaining an understanding of different decorative carving styles then this book is a must-have addition to your library. Carving these beautiful historic decorations to display in your home however may lead to more carving projects- your friends and neighbors will want you to create pieces for their homes too! Projects include: Arts and Crafts Flower Panel Pugin Column Table Chippendale Ribbon Festoon Rococo Mirror Frame Grinling Gibbons Foliage.